While the overall plan for the Smoky Hills Wind Farm was for two phases, the goal was to develop the entire project all at once, if possible. And that turned out to be quite do-able, which delivered some benefits in economies of scale on the construction side. TradeWind Energy had some definite advantages working in its favor with the site for the Smoky Hills Wind Farm in Kansas-proximity to an interstate highway being one-but the project still came with its share of construction challenges, including some good old fashioned, big-time, Great Plains weather. Some wind power construction projects-in out-of-the-way locations-can face the huge challenge of transporting all the wind power components, and the associated heavy equipment, to remote sites before they can even start work. The developers of the Smoky Hills Wind Farm in Kansas were fortunate, however, in that their site straddles both sides of Highway 14 and is just north of Interstate 70, the main east-west highway connection in the state. "Being so close to I-70 offered both ease of construction and access," says Matt Gilhousen, vice-president of operations for TradeWind Energy, which is developing the 250 MW project. "There is a lot of existing infrastructure there that you wouldn't find with an isolated site and that definitely helps with construction. Along with the interstate comes everything from gas stations to cell towers-all the infrastructure that makes Smoky Hills less of a greenfield development." 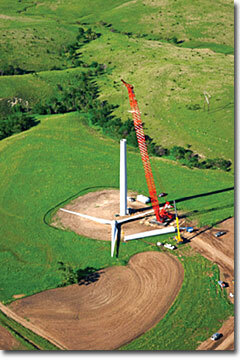 While the site location was a bonus, the Smoky Hills Wind Farm project still faced challenges during construction. However, this being the Great Plains means they can get weather, and lots of it. "Things didn't always go the way they should have, especially when Mother Nature was involved," says Gilhousen. The kilowatts have been flowing on phase one of the Smoky Hills Wind Farm since early this year and phase two of the project is scheduled to be online late this year. During construction of the 108.8 MW phase one of the Smoky Hills project, a major ice storm went through Kansas, followed by several big snow storms. "We had put some transmission lines in and we lost them to the storms," says Gilhousen. But these kinds of temporary setbacks happen, he adds, and you have to bounce back. "This type of weather can make it hard to get things in the ground-and keep lines up-but we've got a great team on the project, and they've done a bang-up job of getting the iron in the ground and the kilowatts flowing." The kilowatts have been flowing on phase one of the Smoky Hills Wind Farm since early this year, and the 150 MW phase two of the project is scheduled to be online late this year. But-as with most wind power projects-there was a significant amount of legwork done before the concrete for the first tower was ever poured. The Smoky Hills area emerged as a strong candidate when Kansas-based TradeWind Energy canvassed the state for possible wind power sites back in 2002/2003. "We looked right across the whole state, from border to border, and Smoky Hills was a prime site," says Gilhousen. "What attracted us was first and foremost the extremely high quality wind resource. It's a phenomenal site from the wind resource perspective alone. 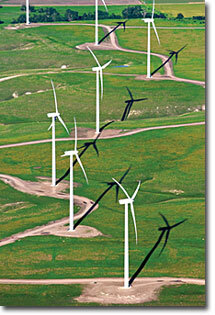 "I'd say it has one of the better wind resources in Kansas, in terms of mean wind speed, to generate wind power. It also offers the availability of different potential off-takers to buy that power, and the transmission system to move that power." As with all wind power projects, access to transmission links was a key consideration. Working in Smoky Hills' favor is that a 230 KV line runs right across the site. Illustrating the international nature of wind power develop-ment in the United States, a division of Enel SpA, Italy's largest power company, is the owner and operator of the Smoky Hills Wind Farm in Kansas. The company is not new to the U.S.; it has renewable energy projects in 20 states, with the first acquisition dating back to 2000. Enel North America, Inc., has signed an agreement with TradeWind Energy, the developer of Smoky Hills, to develop 1,000 MW in wind power generation. "We ran a process of looking at various partners," says Matt Gilhousen, vice-president of operations for TradeWind Energy, "and it happened that Enel was looking, and there has been a good fit between their team and our group. "We hit the ground running with Enel," he adds. "Within months of closing the deal, we were fully involved in the Smoky Hills project." TradeWind Energy faces the same equipment challenges as other wind power developers, making sure it can get the sup-plies it needs from manufact-urers whose production is often stretched to the limit. "We're trying to leverage Enel's buying power, and their expertise, to make sure we can get the right turbines, and get those turbines when we need them for the projects we have under development," says Gilhousen. Added to this, local residents, by and large, were behind wind power. Lincoln and Ellsworth counties, where the project is located, had actually already helped to fund a meteorological tower that happens to be right in the middle of the project site, and brought all kinds of wind data with it. "The two counties and local residents have been extremely supportive all along the way. Their support and help has been critical to the success of the Smoky Hills project." In terms of actual project approval, there are no state regulations covering wind power projects in Kansas; there are, however, best practices siting guidelines that TradeWind Energy adhered to. With the site being rural, there were no zoning issues. "That really does not change our approach, though," explains Gilhousen. "We go through a similar project review process whether it is to meet formal regulations or to get a permit or because of the significant investment in these sites, to meet due diligence requirements." Gilhousen notes that with the growing size of wind farms, as well as their locations, the reality is that the company is now working with a lot more landowners. "Five or six years ago, wind power projects might have involved three or four landowners-now we've got a factor of ten to 20 times that." Phase one of Smoky Hills, at 12,000 acres, involved over 30 landowners, and phase two, at 14,000 acres, involved over 80. While the overall plan for Smoky Hills was for two phases, Gilhousen says their goal was to develop the entire project all at once, if possible. And that turned out to be quite do-able. "We got to a critical mass with off-takers buying the power from the first phase. So as we marched into construction of phase one, and got that happening, we turned our attention to working to get the remainder of the megawatts on the project that were unsubscribed, on phase two." Unlike wind farms that are run on an open market sales basis, TradeWind Energy, and its partner, Italian energy company, Enel SpA, were looking for long-term commitments with Smoky Hills, with power purchase agreements (PPAs). The power produced by the facility is being sold on that basis to Sunflower Electric Power Corporation, Midwest Energy, Inc., and the Kansas City, Kansas Board of Public Utilities. The PPAs came together significantly enough for construction to carry through to phase two, which delivered some benefits in economies of scale. The shift from phase one to phase two was pretty seamless, though some different subcontractors were involved, as well as different turbine suppliers. Vestas supplied 56 of its V80 1.8 MW turbines on phase one, while some 100 GE1.5sle turbines were used for phase two. M. A. Mortenson Company was the general contactor on both phases of the project. "We were pretty much able to pick up and carry on with phase two," says Gilhousen. "It represents a relatively small cost in the overall construction cost of a large project like this, but it can take a month or two to get ramped up and mobilized for construction. It made a lot of sense to keep the team there and not have to demobilize and then remobilize for phase two a few months later." Gilhousen notes that TradeWind Energy was fortunate, and worked hard to have things come together so well for doing it all in one go: progress was being made with PPAs; they had the turbines; the development itself was ready; and the construction crews were available. "It's not always possible to do something like this with the construction crews because a lot of the contractors have their schedules booked and need to move on to another wind project." Gilhousen says that considering its strength, it's no surprise that the wind itself sometimes had an impact on construction activities on the Smoky Hills project. "We had a lot of windy days during construction, and that was a challenge. Wind and weather were probably the biggest challenges on the project." Gilhousen adds that a general challenge with wind power projects lies in keeping things moving and happening on site. "When you come down to it, wind power facilities are not that complex-they are more logistical challenges. "It's the challenge of having all the parts and pieces coming in from various parts of the country and the world, by truck and by rail, and all that makes for some interesting construction projects." Overall, Gilhousen says the project has come together well. But he reinforces that the project is being built on the plains of Kansas, which certainly helps. "It's not like it was a project on a mountain or we had to deal with blasting granite or rock to get it built." Helping Smoky Hills-and all wind projects in Kansas-along financially is a property tax exemption. This represents a significant savings to the project, allows TradeWind to sell power to the utilities at a more competitive price, and improves the overall economics of the project. And they need that, adds Gilhousen. "We are competing head-on with the other sources of energy the utilities might have. And they are using price to determine whether to buy wind power or natural gas-generated power or some other type of generated power." But straight-on competition is fine. "With our great wind resource, the property tax exemption and the relatively straightforward construction here in the Midwest, we probably have some of the cheapest wind power available to the utilities anywhere in the country." It's becoming increasingly competitive for utilities to buy wind power, with generally rising prices for natural gas and coal, and the mounting cost-and difficulty-of building power plants. Even though Kansas does not have a Renewable Portfolio Standard, Gilhousen believes that the growing number of states with RPS will likely lead to a federal RPS. "It's something we support and I think we'll see it over the next few years." That said, TradeWind Energy, with its new agreement with Enel North America (see sidebar story on page 8) has no shortage of projects going forward. And though a lot of the company's focus has been on the Plains and Midwest states, Gilhousen says they're open to taking on work wherever it is in the U.S.
"For the time being, we have a substantial portfolio of projects that we are working on, and we'll probably stay focused on the wind belt. But we look at projects all over the country. You have to look at every opportunity that comes your way-the good ones can be few and far between."